It started with Tunnel of Love, with a simple shot by Annie Leibovitz and Springsteen rocking a nifty bolo tie. Since then, this technique has been used a few more times, with the most cringe-worthy example being the limited released Greatest Hits album released in 2009. Here, Springsteen poses on a motorcycle, trying hard to look "cool", but due to his age, he's giving off a mid-life crisis vibe. My personal favorite is The Promise, which is a beautiful shot from Springsteen's youth. It's unassuming and simple; rather than forcing you to know that this is a Springsteen album, it slowly draws you in. The deserted road and ominous clouds causes you to find yourself as pensive and contemplating as Bruce is in the photo. The cover of The Promise is easily one of the best Springsteen album covers to date, showing that the "lean on a car" concept still has potential. It's a familiar line from every Springsteen fan: "You have to see him live!" In fact, I'm even starting to get sick of hearing how great he is live...but he is! It is tough to capture the power of a Springsteen concert in a single image, but I feel the 1975-85 collection and the Hammersmith Odeon cover do an admirable job. Those covers capture a Springsteen mid-concert, and you can feel his exhaustion as he is pushing his stamina to give his all to his fans. However, the live cover trope has a few stinkers, specifically the uninspired Live In New York City (which is such a disappointment for such a fantastic live album) and the MTV Unplugged album (which is easily my least favorite Springsteen album cover - it looks like a cheesy wedding photo). Easily the most over-used of the Springsteen cover motifs, and these are the most difficult to defend. It's.....Springsteen's face. We get it. 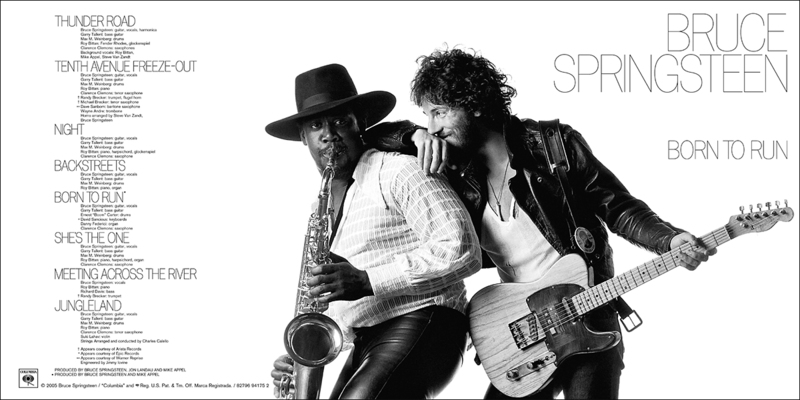 There is little mystery when picking up one of these albums: you are getting a bunch of songs by Bruce Springsteen. It's become more frequent in modern times, the obviousness of this design only being usurped by the Wrecking Ball cover which has the words "BRUCE SPRINGSTEEN" taking up 80% of the cover. Bruce has the capacity for iconic covers. Born To Run and Born In The U.S.A. are not just two of the most iconic rock-and-roll records of all-time, but two of the most iconic rock-and-roll album covers of all time. An album cover is your gateway to the world that the music inside will create for you, and it is an opportunity to create a concrete visual forever associated with the songs inside. That is a bit flowery and pretentious, but I can't help it: I like a good album cover. I look at some of the great images mentioned in this article, and I know Bruce can do better. I've got my fingers crossed he'll prove me right in the future.